According to the Island Free Press, the Froggy Dog restaurant in Avon is under new ownership. We were never impressed on our prior couple of visits to this establishment. 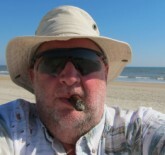 However we will give it another go round on our next trip to Hatteras in a few weeks. Pirate themes can't be all bad, right? Let us know what you think! We’ll be down in a couple months and just a short walk away from the Froggy Dog. Went to Froggy Dog today for lunch. Extremely polite people, new menu and (burp) a very nice lunch. I asked a couple of groups of people leaving when I was arriving what they thought. They were happy. I like a good hamburg and was not disappointed. But the apple pie! Seems like it is baked next door, at Muffins and Scones, and is really excellent pie. Took a look at the dinner menu and it had a number of entries I'd like to try. Time will tell but for now, put Froggy Dog back on the list of good places to eat in Avon. I liked the original Froggy Dog. Back in the 80s, Frank (of Frank & Fran's) ran a breakfast and lunch place called the Froggy Dog in a sound front cottage in north Avon. The breakfast biscuits were huge and delicious. My wife remembers that original Froggy Dog. We ate there 4-5 years ago; 1 of the pieces of flounder I ordered turned out to be catfish, and the rest of the food was so-so. Never went back. Just went there this evening with the new owners; much better this time. The salmon I got was as well prepared as any I have had on Hatteras Island. Haven’t tried Froggy under the new owners, but, the same owners make great bagels next door! Stop there every morning that I head north. Speaking of bagels. Still miss Max Bagels. They truly were the best.